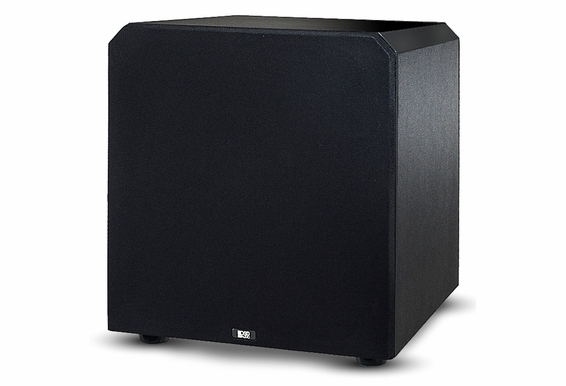 The PS10 subwoofer is a free-standing and fully powered 10-inch subwoofer. 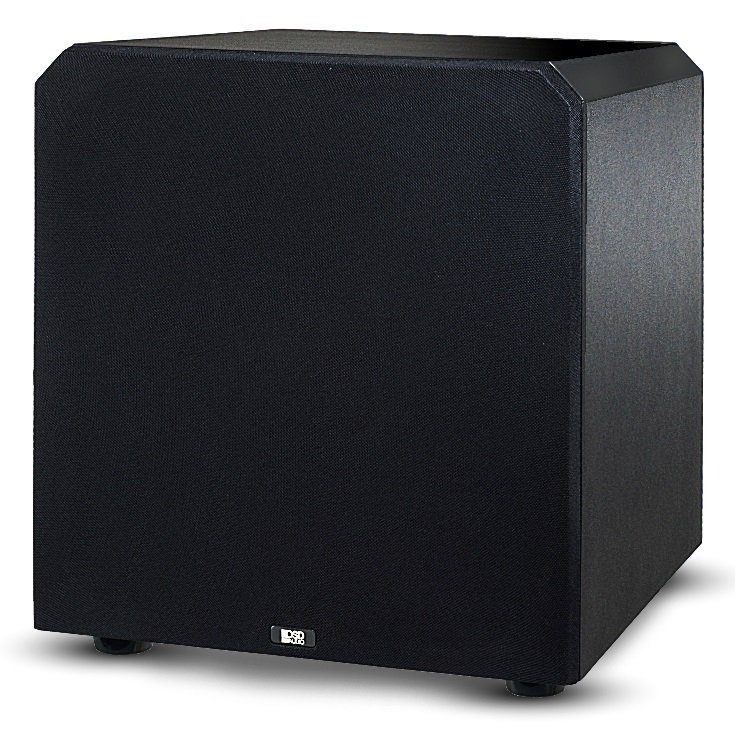 This is an ideal subwoofer for a home theater or a small to medium size room where you wish to have full, powerful sound. 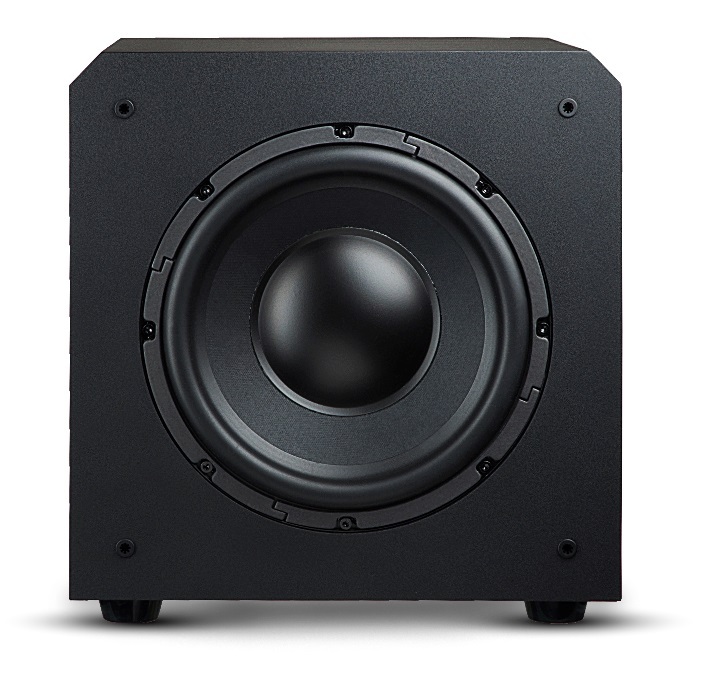 If you're looking to replace your home theater subwoofer (not working? ), the PS10 is one you should seriously consider as a replacement. 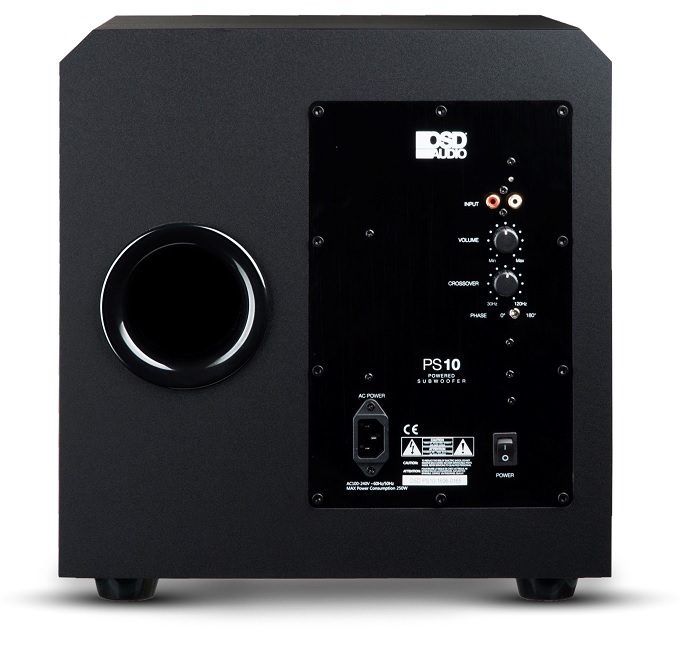 The OSD Audio PS10 high performance home theater subwoofer has speaker level inputs and delivers 200 watts of power. Was looking for a budget sub for an office/pc gaming room when i came across this site. Interesting 10" option sub option that appears to be good quality. I noticed there are 2 versions of the PS10 sub. One with a beefier looking amp with metal cooling fins, and the new one without. Any major differences with the amp internals or was it just all aesthetic? The fins seem to help cool the amp according to a review from 2012. Also, is the down firing S10 still available? My house has a raise foundation and wood floor/subfloor. Wouldn't a down firing sub sound better? I have a Sony STR-DH550 Multi Channel AV Receiver. Will this PS10" be compatible to my unit? I see photos of this sub without the sloping edges on Amazon and the amp has fins. Is that the older version of the sub? If I order now, what version will I get? I am setting up a 7.2 setup with one subwoofer front left and one back right. What sort of room size will 2X PS10 cover and when should I move up to PS12s? In the description of the PS10 you mention it has two front ports that allow you to tuck it into a cabinet. That appears to be for the older design. The images of the newer design show a single, rear port. Does this mean it's no longer suitable for placement in a cabinet? Also, what is the RMS power of the amplifier? I am interested in building a 2 zone indoor/outdoor audio system using the attached equipment. Do I need an Amp as well as an AV receiver to power the system? And.....If the AV Receiver ALONE will do the job....can you recommend one? HI Nathaniel: You have two options from us. First would be a combination AMP 200 and our Pre1 Pre amplifier which would basically duplicate a receiver less the AM/FM Tuner. The second choice a more affordable option but still quite good would be our new XMP-100 Digital Amplifier along with the Pre1 pre amplifier as well. In both cases the Amplifiers have speaker A and Speaker B. A could be outdoor and speaker B could be indoor. Also choose Input source #2 for the AMP200 and Main input on the XMP 100. Both inputs feature a dedicated output to connect to your Subwoofer. Then checkout adding either an external WiFi or Bluetooth Receiver or both. You have 4 inputs on the Pre One including a phono pre amp. Checkout the Logitech Bluetooth receiver on line. TL/4211 Note: I believe you submitted a request through our upload your plans feature. My contact info is tim@osdaudio.com if you need further clarification. Why is this more expensive than your 12"? I am deciding between the two for a 5.1 system. I watch mostly movies and xbox. I have a Denon receiver with 2 RCA subwoofer outputs. My PS10 sub only has L and R line input. I am not getting any sound on either input that I plug into. I used a 50 ft. RCA cable. Hi Nino, What kind of cable are you running from your receiver to the subwoofer and from which output on the receiver? Thanks for responding so quickly. 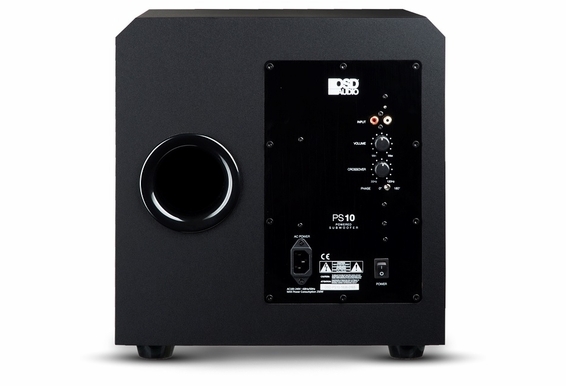 I will be connecting a OSD AMP 200 to zone 2 on the A710 to power dual speakers in the bedroom, dining room, and outside patio, so I can't zone 2 as you recommended. However, the AMP 200 will be connected to a DSM4 speaker selector which will have an unused zone. Could I connect the PS10 (using level line) to this empty zone on the DSM4 as "speaker selector A" position will be transmitting what is playing through my home theater system?Thanks for responding so quickly. 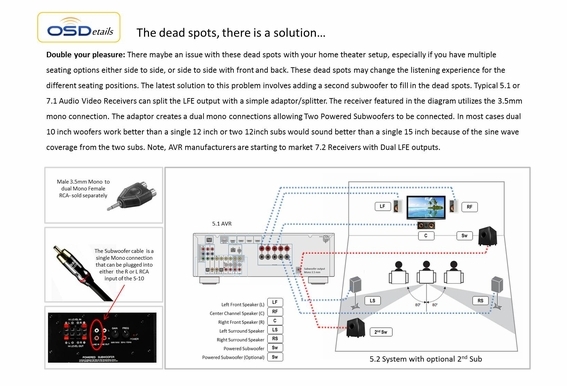 I will be connecting a OSD AMP 200 to zone 2 on the A710 to power dual speakers in the bedroom, dining room, and outside patio, so I can't zone 2 as you recommended. However, the AMP 200 will be connected to a DSM4 speaker selector which will have an unused zone. Could I connect the PS10 (using level line) to this empty zone on the DSM4 as "speaker selector A" position will be transmitting what is playing through my home theater system? I have a Yamaha Rx-A710 and That I am building a whole house audio around. My house is prewired, and my subwoofer outlet is wired with 4 wire speaker wire instead of RCA connections. 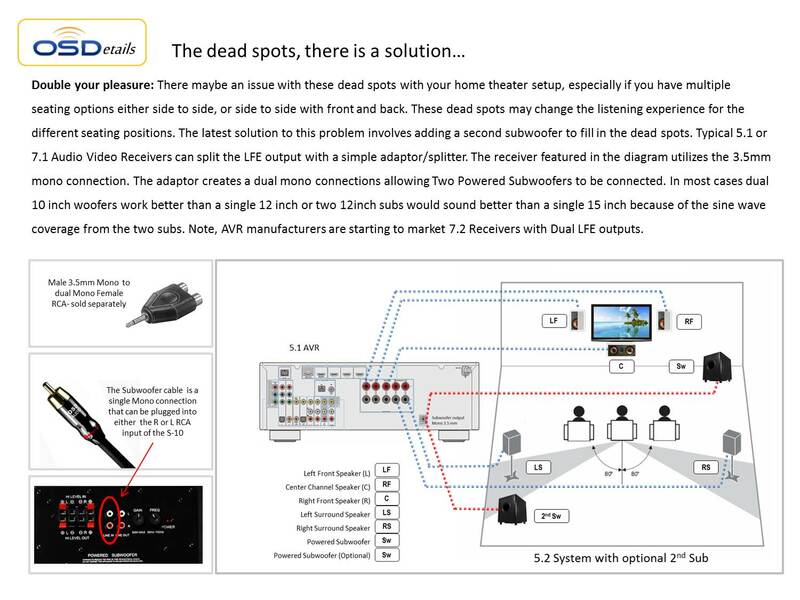 So I can't use the subwoofer RCA output on the Yamaha receiver to connect a PS 10 (unless I run a subwoofer cable outside the wall - which I perfer not to do for asthetics) . 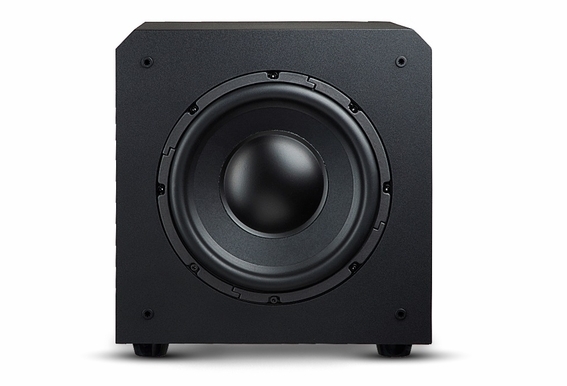 Which R and L level Line speaker outlets on the A710 should I connect the subwoofer to (I will be doing a 6.1 surround sound so I only have one open speaker connection --the right back surround sound)? Do Ihave to do stero to the subwoofer if use a level line connection? Can I hook more than one speaker to each connection on the back of the A710? Thanks. Can you tell me what this subwoofer weighs? It's not listed. There are no dimensions specified either. Lastly, what's the true frequency response? It says 5Hz-180Hz, but it can't possibly get down to 5Hz.